The Enid have finally re-emerged after many times falling by the wayside for various reasons. After a couple of strong releases and tours like the recent Journey’s End the main man Robert John Godfrey is really visibly back, with his band. Classically trained RJG has meant that the bulk of influence throughout The Enid's catalogue is very classically orientated, so it seems perfectly natural to play a concert with the CBSO. I grew up with The Enid so they have a slightly special place in my music education, whose music is quirky, powerful, never predictable and slightly effervescent at the edges. 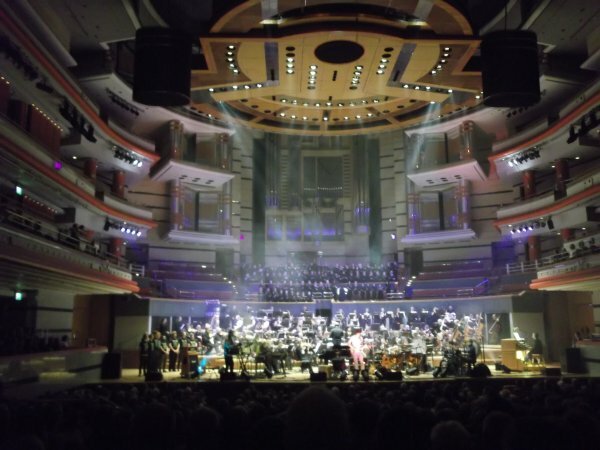 The Symphony Hall was full and what a spectacular place with it proper pipe organ! The orchestra came on stage, followed by the band and RJG on crutches. (He didn't play them. :-) ) "We are here, you are here, so let's do it! ", enthused RJG soothingly to the crowd of sympathetic smiles. The fans are very tolerant and patient, waiting years for The Enid to produce new music and they know it will come, when RJG is ready. The first half started with ‘Judgement / In The Region of the Summer Stars’ which is my favourite Enid piece of all time, so I was very happy indeed. The scale of the orchestra was fantastic and is a real reminder that the actual structure, melody and composition of this piece is essentially a classical piece. Throughout the first piece, even sitting 7 metres away from the guitarist Jason Ducker, I could not hear hardly anything he was playing. Sporting a Jeff Beck haircut and t-shirt outfit, and exceptional use of the whammy bar, it would have been nice to really hear him. Alot of the melody in this piece is actually carried over the top by the guitar, holding the lead lines. I hoped that the sound man would adjust things. Childe Roland was another song where the lead guitar provides a real handle on the melody, but again, unless one knew what the melody was, it was difficult to pick out. The orchestra still made this an enthralling performance. The Lovers, is solo piano piece with the orchestra. The piece is a beautiful and moving one and I would question anyone on the planet not to be moved by it. Again perhaps I am being over critical when I say the following. RJG decided to play a new electric piano, instead of a real piano. 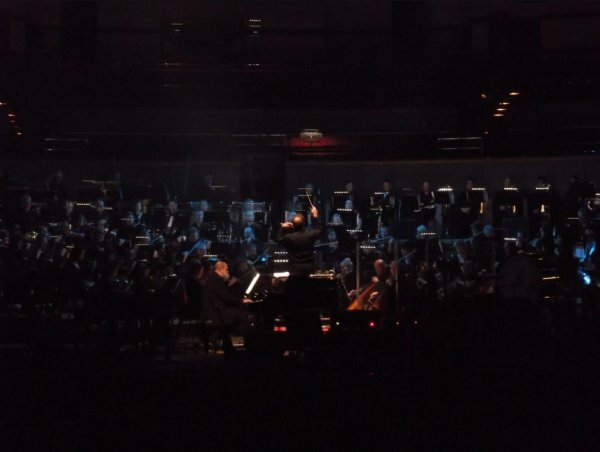 I hope in all sincerity that it was the bad sound that marred this performance for me, but against the huge natural warmth of the orchestra, this amplified piano through the PA 30 feet above the orchestra was not loud enough, sounded tinn and was missing all the drama, emotion, depth and scale of a grand piano, I felt robbed. Sound quality? Dare I say this? 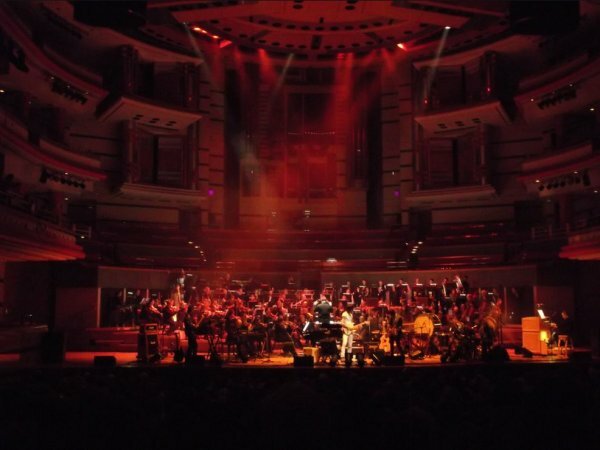 The Symphony Hall has fantastic acoustics, just listen to the natural voice and orchestra to prove this. But for the electric amplified instruments on that night the sound was terrible. Even through the microphone the human voice was not clear, this was clarified by another pair other 'less demanding' ears. A surprising rendition of Fand, meant that The Enid were including their epic mainly classically focussed tracks. Fand brought the first set to a close. Fand again was superbly executed by the orchestra, but I couldn't hear the guitarists or even RJG. Because the drummer, Dave Storey was perched on the edge of the stage and at times it just sounded like 'CBSO and Dave Storey play a tribute to The Enid'. I saw Adrian Belew with the Metropole Orchestra where the drummer was just infront of the orchestra, and thus sounded far more integrated in the piece of music. Even that said it was a total pleasure to watch this performance of ‘Fand’ and afterwards the audience adjourned to the bar, stunned and speechless. At the intermission I considered that I was being over critical and too demanding, so I decided to listen to other people's comments around the bar.. "Fantstic, one of the best concerts ever", "The Enid are amazing" and finally , "I can't hear the band themselves...The Enid were totally overshadowed by the CBSO...". Probably due to the fact that the band were not highly audible on stage. I am not sure what the 'tactics' of the night actually were, whether to let the orchestra dominate or not, but I was glad that others were thinking along the same lines as me. After the intermission, we were exposed to a 10 minute reading which basically was a history of homosexuality, by Alan Moore. Let's just say that many of the audience didn't expect this and I am not sure that it was the right demographic for his rhetoric, with many uneasy faces wishing that it would end. Although, due to the bad microphone vocal sound quality and Alan's Birmingham accent, most of it was quite unintelligible. It brought a tense atmosphere to the place which spoiled what had preceded. The second half brought virtually a full performance of the current Journey's End album, which is essentially sequential pieces of music to be listened to in its entirety. Commencing with the typical Enid-esque ‘Terra Firma’ and winding its way through to the main piece. It also involved bringing onto the stage both female and male choirs to emphasise certain keyboard parts. This was very well received in the hall. After a touching tribute to Wolly Wolstenholme, (who died recently in December 2010 and worked with RJG in Barclay James Harvest), commemorated him with a rendition of Mocking Bird. This was more 'rock band' orientated so we could try and hear more of the band. Everyone clearly enjoyed this piece and people were again smiling, the honesty of all the fans and musicians shone through. I apologise if I have given a slighly critcal summation of the evening, but having followed The Enid for so long, it just could have been better. The event was indeed "powerful and romantic", just as the evening title suggested, but it could have been more powerful and romantic with a balanced and integrated sound. It's such a shame that The Enid themselves could not be heard, or even have 2 tracks to play without the orchestra. If one is to play with the CBSO, you can't transport them to a 'rock venue', so you have to dine with them. The concept of the event was of great importance to The Enid. I am not sure that it was pulled off 100%. I am glad that The Enid are back, gigging and producing music again. It is a testament to RJG that his music works as a on a 'Prog /classical' level, or just orchestral. It was great to see Dave Storey, RJG, including ever maturing talent from the rest of the guys in the band. Overall, I bought 2 CD's that had been lost to me, watched a stunning orchestra, was confronted about homosexuality and listened to a band that I really like for 2.5 hours. Only The Enid would dare to provide such an eclectic mix, which is why they are fantastic.